Vibro cleaner is specially designed for effective cleaning of all type of Paddy as well as Wheat, Barley, Corn, Soyabean, Peas, Various Pulses, Seeds, Cereals, Green Coffee and all granulated products. Two airlocks with motor are provided to collect immature, chaff, dead grains and waste separately. 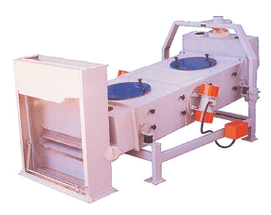 This helps rice millers for increasing yield as well as improving the quality of final product. This machine ensures higher cleaning efficiency than all other cleaners. The machine has a fully enclosed body for dust proof operation with shock absorber. Design in 3 deck sieves for better cleaning efficiency. High efficient Cleaner, fitted with vibro motors. Removal of course and fine impurities by sieving. Special quality sieve cleaning device. No loss of grain in waste as it is collected through main cyclone. This is possible due to intermediate cyclone. Effective cleaning for all type of grains material. Low maintenance cost due to less moving parts. Higher cleaning efficiency with low power comsumption. Separation of immature grains results in extra yield. Can be used for grading also.